Now that I've yammered on long enough, here is the recipe. You can do each plate separately or add all the ingredients together in a large salad bowl. 1. Start by adding the salad mix to a large bowl. 2. Cut the Strawberries to the size that you want and add them to the lettuce. 5. Sprinkle the Feta Cheese on top and then add the Croutons. 6. Now the salad is ready to be tossed. 7. Drizzle the dressing on top. I prefer not to put the dressing on the salad and let each person decide if they want it on their plate instead. Note: A few of the items in the salad will make the lettuce and croutons soggy quicker. I suggest making the salad last and not adding the dressing until you are ready to serve the salad. You could also add a protein such as baked chicken and have a complete meal. And if you're wondering about the name of the salad, then here you go. Sherry works for Jesus, literally. She was at an event when a Nun gave her the recipe. Obviously she forgot to ask the name of the salad. 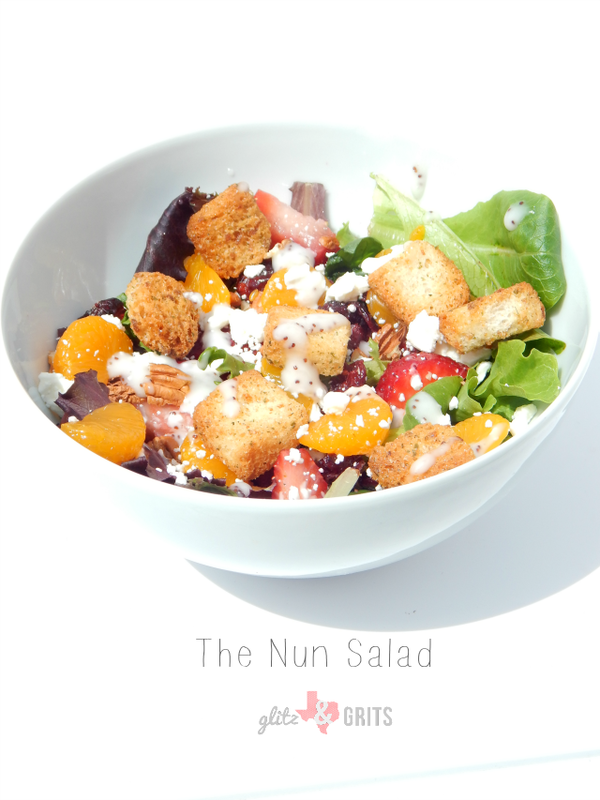 So it's now "The Nun Salad." YUM! Your pictures look so good! I would like that salad for lunch! I will be trying this! Thanks for linking up with us! Really, good-looking salad. I too will be making it, sooner than later.